This chapter addresses a number of issues related to wood as a material used in covered bridges. The discussion does not duplicate information readily available in common references. Instead, it attempts to clarify some topics that are of special interest to covered bridge designers and contractors. It is important to be definite when specifying wood to be used in covered bridges. "Wood" usually simply indicates material cut from trees. The word can imply reference to any size structural component. "Wooden" technically indicates objects or structures made of wood. Hence, covered bridges are wooden structures. Yet, in common usage, covered bridges are often also called timber or timber-framed structures. "Timber" is used in a number of ways when discussing covered bridges. Timber often denotes larger-sized wooden members used in structures. The NDS defines timbers as those components at least 127 mm (5 inches) thick. Timber also is used to describe standing trees before harvest. "Timber Engineering" usually refers to structural engineering that specializes in wood products; those working with buildings may refer to it as wood engineering. "Lumber" is used in confusing ways. Technically, lumber can indicate any size structural component, usually solid-sawn, as compared to manufactured with wooden subassemblies. Lumber commonly refers to wood products with sizes smaller than timbers. The NDS cites dimension lumber as that with thickness from 50 to 100 mm (2 to 4 inches) to differentiate it from the larger timbers. A common question that often arises when discussing extant covered bridges is, "What species of wood was typically used in these bridges' construction?" Although Douglas Fir and Southern Pine are the most popular species for more modern structural applications, most historic covered bridges were constructed with softwoods found fairly close to the bridge site. Eastern Hemlock, White Pine, and Spruce are commonly found in those bridges in the East. Douglas Fir was used in almost all western bridges. The southern covered bridges were built mostly with Southern Yellow Pine. As important as the species is to the evaluation of covered bridges, the quality of the wood used must be put in context. Extant covered bridges, especially in the East, were often built with timbers fashioned from logs cut in the magnificent first-growth eastern forests. The timber cut in the 18th and 19th centuries differs significantly from the timber on which modern timber design codes are based. Note that while we say the timber is different, the wood itself generally has not changed much, if at all. A Colonial-era Eastern Red Spruce is genetically indistinguishable from today's pulp logs. What have changed enormously are the forests and the trees from which those forests are made. Those first-growth, natural primeval forests were full of relatively wide-spaced, immensely tall, very thick trees. Their branches, or canopies, were far above the ground, the result of centuries of competition with their neighbors for sunlight. The competition was tough enough that the trees grew slowly, once they were of any size. The resulting wood had very tightly spaced annual rings, or tight grain. Because the canopies were so high, the logs were long, with only a few of the branches that cause knots. Much of these trees' trunks had the opportunity to evolve from sapwood to the harder and more durable heartwood. In short, original covered bridge builders had local access to some of the best structural timber in history. Another issue important to the wood of extant historic covered bridges is the fact that original timber often was cut from such large logs that many of the members are free-of-heart-center (FOHC), or did not need to include the heart of the tree within the sawn member. Not only are those FOHC pieces free of the tree center, or pith, which is weaker wood because it is the faster growing juvenile wood, but also they tend to be far more stable in use. The far more common boxed heart wood, which is found in contemporary timber and is cut from smaller logs, is much more prone to distortion and splitting as it seasons. This increased movement in boxed heart timbers is caused by the differential shrinkage rates between the radial and circumferential directions. The first-growth logs were often so straight and clear of branches that the lumber cut from them generally has far fewer imperfections, or grading defects, than found in the modern timber assumed in current design codes. The most significant lumber flaw to which these original trees were prone is the sloping grain that comes from poor sawing practices or spiral grain in the trees. This serious structural flaw can be found in the large timbers of queenpost and kingpost trusses, but only rarely in the planks used to frame Town lattice trusses. It might be assumed that those planks dried quickly enough to show their flawed grain as sloping checks in time to be replaced before truss fabrication, and that they were cheap enough that the builders were willing to replace the flawed planks and cut them up for less critical uses. In any event, the covered bridges that have survived often show signs that the builders were careful to have sorted the available stock for high-quality timbers. Chapter 13 discusses the issues involved in establishing allowable timber member stresses when evaluating covered bridge capacities. That section includes more material about dealing with the extant old-growth timber versus modern timber components. The availability of wood components for repair or rehabilitation is sometimes neglected in the early plan development phase of covered bridge work. The extant bridge often was built with timber components of lengths and cross sections that are larger than what is currently available. 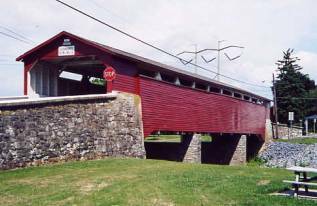 For instance, a recent reconstruction project in Upstate New York (the Hamden Covered Bridge in Delaware County, NY) involved replacing the bottom chords of a Long truss. The original Eastern Hemlock members were 230 by 330 mm (9 by 13 inches) wide by about 15.2 m (50 feet) long. They would have been cut from an impressive tree, even for the time of the construction in 1856. A bridge in central Vermont (the Mill Bridge in Tunbridge, VT) unfortunately was destroyed by ice floes in March 1999. The original challenge was to replace it generally in-kind with local softwoods to pay homage to the original construction. However, modern design requirements and loads, coupled with current allowable stresses, meant that local hemlock was not available in the sizes and grades to satisfy the design criteria. Ultimately, the bridge was rebuilt with Douglas Fir imported from the western United States. Part of this problem can be traced to the tendency of the NDS to list and describe timber materials and sizes that may not actually be available in various regions (e.g., Select Structural Eastern Hemlock or Dense Structural 86 Southern Pine). A designer might find timber species and grading information in the NDS and proceed with the design accordingly. Then, when challenged to help the contractor find the specified material, the engineer finds that it is not available after all, or it is cost-prohibitive. Therefore, it is important to consider timber availability before beginning the design process. A minimum appropriate effort might be to contact potential timber providers early in the project. There are only a relative few in the United States that provide the bulk of larger (and higher allowable stress) timber components. The designer might also discuss potential project needs with contractors experienced with covered bridge work. Contact between designer and contractor requires consideration of potential conflicts during the bidding process, but the improvements in the bid documents can be significant. Hence, one might solicit advice from a contractor in another geographic area who does not intend to bid on the project in question. Another related issue involves choosing a timber species for any replacement components. In many instances, new components are chosen based almost solely on strength properties. Fresh-sawn Southern Pine and Douglas Fir have similar strength properties, yet Douglas Fir is more available in larger sizes and lengths. Some timber craftsmen prefer Douglas Fir to Southern Pine as a more workable wood. Others, however, find that fir can be more prone to splitting than pine. Again, it is best to check early in the process with those who specialize in this type of work (or, at least, with this type of material) to determine the preferred timber replacement material in the geographic area of the project. Existing covered bridges often were built with green wood and usually have served well, despite the lack of intentionally dried wood. Those dealing with the rehabilitation of a covered bridge must decide whether to use dried or green wood. This section presents both sides of a controversial issue. Green wood typically is somewhat less stiff than seasoned. Green wood can mask inherent weaknesses in timber, such as inclined grain. Green wood will shrink after installation, while seasoned timber does not change size in any appreciable way (if sheltered from the direct weather). Green wood is slightly more susceptible to degradation from fungi and insects. Green wood does not retain wood preservatives and paint/stain as well as dried wood. The Wood Handbook: Wood as an Engineering Material, published by the United States Forest Service, offers an excellent discussion on drying wood. For all these reasons, it is desirable to use seasoned wood in covered bridge work, even if seasoning takes time. Thinner materials (up to 100 mm (4 inches) thick) can be kiln dried, a process that can take up to a week or more. It has been impractical to attempt kiln drying of larger timbers; hence, it is common practice to either use green material in projects (which can result in unplanned stresses during in-place drying), or to specify seasoned material. Radio frequency, or microwave, kilns are now available for drying large timbers in relatively short times, albeit at considerable expense. Previously thought to cause little undue damage by rapid drying, there are recent reports of some problems with internal honeycombing by microwave kiln drying. These new kilns are found mostly in the Pacific Northwest. Even with careful and sophisticated restraints during drying, many timbers may require a second sawing before being suitable for fabrication. Shrinkage in the kiln, subsequent resurfacing, and some timber loss in the drying process all mean that the original timber order will need to be bolstered to compensate for these losses. Dried timber is better to use in repairing existing structures. However, it is important to consider the cost of using dried timbers versus the consequences of using green timber. On a timber order of the size common for a major rehabilitation project of a covered bridge, the cost of kiln-dried timber will be much more than green. In some cases, it could be double the cost of that for unseasoned, fresh-sawn, timbers. Another way to obtain large timbers that are already dry is to use recycled, or salvage, timbers. Many industrial structures were framed with heavy Douglas Fir or Southern Yellow Pine. These buildings are being dismantled to make way for other projects, mostly in urban areas. Rather than simply hauling the material to landfills, many demolition contractors are finding that it pays to dismantle the structures and sell the timbers to reprocessors. These timbers are generally high-quality and cut from first-growth logs. They also usually have bolt holes and notches that bear consideration. The industry is slowly developing standards and grading rules for using and establishing allowable stresses in these recycled timbers. The economics involved with specifying recycled timbers are unpredictable, at best. A lot of recycled timber may be available at any time, but this timber will rarely have the dimensions that the designer needs. The raw material price can also seem low, but hauling, stripping hardware, resawing, and sorting can add much to the in-place costs. The material cost of a recycled timber, in place, might be higher than for glulam timbers, for example. To demonstrate the design penalties involved with using nondried wood, consider the NDS specifications for sawn materials (refer to the commentary in section 2.3.3 of the NDS, "Wet Service Factor"). Those components subject to moisture contents higher than 19 percent during service are subject to capacity reductions unique to the stress type being investigated. The largest adjustment factor of 0.67 is for compression perpendicular to grain, meaning that only 67 percent of the basic value can be used. Although compression perpendicular to grain is not encountered commonly during routine design, adjustment factors of 0.80 for compression parallel to grain and 0.85 for bending are specified; those types of stresses are commonly encountered in covered bridge design. NDS specification reduction factors for glulam components are even more restrictive. For moisture contents in excess of 16 percent during service, the allowable stress adjustment factors are 0.53 for compression perpendicular to grain, 0.73 for compression parallel to grain, and 0.80 for bending. Covered bridges rarely contain elements subject to moisture conditions during service that approach the upper limits noted above; therefore, this issue is almost moot. However, in some rare instances, the lower elements (bottom chords and floor beams) of bridges with very low clearance above water may be exposed to higher moisture contents during service than desired. Accordingly, it is prudent in those instances to consider the moisture penalties of the NDS specifications. While not directly related only to material issues, the use of green wood in rehabilitating a covered bridge should include provisions that require the rebuilding contractor to return to the structure to retighten all bolts and wedges, say, after 6 months shrinking and settling. The period would depend on the as-installed moisture contents. Further, the project schedule should provide adequate time for drying, should it be required. Nominal size is the most common type of cross-sectional identification. Nominal sizing refers to the rough-sawn, initial cut size of the timber, before any drying or finishing. Dressed (or finished) timber has been further processed to plane the sides; this provides a finished, or smoother, appearance and helps "true-up" the timber to parallel sides (the initial rough saw cut may have resulted in slight thickness variations along the length of the member). This finishing typically removes up to 12 mm (0.5 inch) of thickness. Full-sawn timbers are actually the same size as their nominal size would suggest. Hence, full-sawn timber is cut from larger dried timber so that the full-size timber will not shrink further after drying. Full-sawn timbers are either used rough, directly off the sawmill, or are custom-sawn oversized so that they are still full size after planing. The rough, off-the-sawmill timbers are cheaper than planed nominal timbers. Although covered bridges use heavier timbers, the lighter dimensional lumber framing industry provides insight in this regard. It is commonly recognized that a "2 by 4'" (50 by100 mm) is not actually 2 inches by 4 inches. In fact, the real size of finished 2 by 4s has changed over time. For a long time, they were typically finished at 1 5/8 by 3 5/8 inches (41 by 92 mm). More recently, the size has been reduced to 1 1/2 by 3 1/2 inches (38 by 89 mm). Hence, the 2 by 4 dimension is the nominal designation. The 1 1/2 by 3 1/2 inches dimension is the finished, or dressed, size. Similarly, for many years the finished size of heavy timbers (up to 150 mm (6 inches) nominal) has been 12 mm (0.5 inches) smaller than nominal. For larger members, the attendant drying and planing losses have made for a 19-mm (0.75-inch) reduction from nominal to actual. The NDS supplement includes a comprehensive table of the standardized nominal sizes and their actual cross-sectional dimensions. The sizing convention is important on covered bridge projects, because almost all the timbers used in a covered bridge project are unfinished (with the possible exception of the siding installed during subsequent rehabilitation). Further, because the focus of this manual is on historic (existing) covered bridges, the work discussed here deals with rehabilitation of existing bridges. Therefore, the designer must deal with the measured in situ sizes of existing members. Although new or added members may be different sizes than the originals, the connections and details must be compatible with existing conditions. As an example, if some chord or lattice members in a Town lattice bridge are being replaced, the new members should be the same thickness as the existing ones to minimize the problems of the physical removal and replacement, and in making connections. A more common issue regarding timber sizing is the use of full-size members versus nominal. In many cases, using full-size members means a slight improvement in strength, which could be important. Further, many timbers for covered bridge components are resawn from larger components that have been previously harvested and air-dried in larger cants. Therefore, it is often an advantage to specify full-size members. For those larger members from fresh but resawn timbers, the cost penalty for full-size members is small or nonexistent. Engineers should be careful when using precomputed geometric properties of wood sections (e.g., A, Sx, and Ix), because small changes in actual dimensions can lead to large changes in those values. Glulam components are fabricated from dimensional lumber that has been dried and finished before gluing. The individual pieces are often planed again, just before fabrication, to improve the uniformity of their thickness and the glue-line quality. This means that the depths of the fabricated member are well-defined, based on the number of laminations of material used in its construction. The current standard of the industry uses 35-mm- (1.37-inch) thick laminations, and the component is made from Southern Pine (reflecting that secondary planing step), while 38-mm- (1.5-inch) thick laminations are used when the component is glued with components from western species. The width of glulam components is based on the size of the individual pieces used in their construction. During the fabrication process, the side faces of glued components can be very uneven, due to slight unevenness in the widths and slight sweep and twist in the individual pieces used. Excess glue is also squeezed onto the side faces of the members. At the finished stage, standard practice involves planing them after gluing to preestablished widths (as specified by current standards) to remove the width unevenness from the fabrication operation and to remove excess glue. Glulam components often are used to replace original solid-sawn members in a covered bridge. The most common application for the stronger glulam beams is for transverse floor beams. The glulam member will rarely match the existing height dimensions and may have to be cut to fit at the beam supports at the longitudinal trusses. This material shift rarely represents any significant challenge. However, if glulam components are used to replace truss elements, then the actual widths of the members may become important. Because the glulam members come in standardized and established widths, one must carefully consider the ramifications of these standard widths. On a recent covered bridge rehabilitation project in Upstate New York (the Hamden Covered Bridge in Delaware County, NY), the bottom chords of a truss were to be replaced with glulam components. The existing truss used pairs of vertical elements with three horizontal chord elements that straddled the verticals at their connections. The existing central chord element was rough-cut and averaged 229 mm (9 inches) wide. The closest size of a standard finished glulam element was 222 mm (8.75 inches) wide. It would have been possible to replace a 229-mm- (9-inch) wide element with a 222-mm- (8.75-inch) wide member, but it was also possible to specify an industrial finish (in which the element is not planed after gluing) for the glulam member. This effectively reduced the amount of material that had to be removed in finishing the member and meant that the final width was very close to the original 229 mm (9 inches). Another excellent summary is contained in Timber Construction for Architects and Builders. Since this manual focuses on aspects unique to covered bridges. the following presents only an abbreviated discussion of this topic. As a basic introduction, wood preservatives are either oil-based or water-based. Creosote, first used in the mid-1800s, was the most commonly used wood preservative for a long time. However, the difficulties of working with creosote within today's environmental restrictions have made it less popular. Today the most popular oilborne preservative for covered bridge use is pentachlorophenol, or "penta." Some prefer waterborne preservatives; while chromated copper arsenate (CCA) is one of today's most popular waterborne preservatives, the arsenic component's effect on the environment is a concern, and its use is becoming restricted. It is unclear at this time which of the other waterborne preservatives will become the preferred replacement treatment for CCA. Although field application of wood preservatives is possible, it is typically restricted to treating only field-cut surfaces. Applied by brush, roller, or spray, the surface treatment is relatively ineffective when compared to pressure impregnating the preservative. The typical preservative-treated timbers used for covered bridge materials are provided by specialty companies that have invested in this special equipment. The pressure treatment ideally is performed after initial cutting and drying, before delivery to the project site. This means that all end grain surfaces that are exposed during fabrication are also subject to pressure treatment. It is easy to recommend that all wood components used in rehabilitation of covered bridges be treated with preservatives. However, there are issues involving preservatives that make their use somewhat controversial, or at least not automatic, for those involved in specifying the work. The original structural elements of most extant historic covered bridges were built without preservative treatment. Some wood species are more resistant to rot (e.g., White Oak, locust, tamarack) and were used in critical locations such as floor elements, bearing blocks beneath the chords at the abutments, bottom chord elements adjacent to the abutments, and posts at the ends of the bridge. Modern rehabilitation projects may consider use of these species in lieu of pressure treatment. The first widely used wood preservative, creosote, did not become available until the mid-1800s. 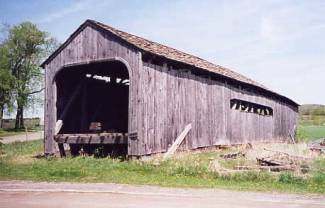 Preservatives would have undoubtedly protected some covered bridges from early demise with rot, but using preservatives is not nearly as important in long-term performance as is maintaining effective siding and roofing materials on the bridge, and covered bridge builders understand this. Rehabilitation projects often proceed with an initial order of material based only on an investigation that was conducted with the structure intact. After the rehabilitation is underway, it is common to find additional deterioration in elements not originally identified for replacement. Rarely do projects have enough time to order additional materials at this midpoint and wait for the pressure treatment process that is usually used for preservative treatment. In some situations, the extra time for the pressure treatment process may be unacceptable, and untreated wood is used instead. It is best to order extra components initially, to ensure that ample materials are available when rehabilitation begins. With luck, additional material does not need to be ordered in the middle of the project. The use of preservatives is logical, in this instance. When preservative-treated timbers are used, this is especially helpful. Another important design-related issue with wood preservatives relates to one of the most popular species in this context, Douglas Fir. The cell structure of fir is nonuniform in its composition, thereby limiting fluid flow and making pressure treatment inconsistent. The practice of incising the wood (cutting slits into the surface) before pressure treatment greatly improves the penetration of wood preservatives in firs, but this incising structurally damages the elements; this structure is most important to thin members. The 1997 NDS introduced a reduction factor of 15 percent for bending, tension, and compression stresses for incising of dimension lumber. Dimension lumber is defined by NDS as material from 50-100 mm (2-4 inches) thick. Hence, this reduction is not relevant to heavy timber elements, but is of special interest for the components of Town lattice trusses. This is a substantial reduction and can easily lead to using Southern Pine as a substitute, because it does not need to be incised before pressure treatment. Ideally, pressure treatment would be performed after all fabrication cuts, due to the exposure-related health concerns of cutting pressure-treated timber. However, cutting additional pressure-treated members is required in many situations. In those instances, appropriate safety precautions are required. Surface preservative treatment applications are prudent after such cuts. There are occasional objections to the appearance of wood treated with preservatives, as compared to the extant wood without preservatives. The surface can, initially, have a greenish tint. The incising of Douglas Fir produces a texture that does not look particularly natural. Closely related to preservative treatments in wood (discussed in the previous subsection), some bridges are treated in place to deal with specific infestations of wood-destroying insects. Bridges in southern regions are prone to attack by termites or carpenter ants, and routine treatment against this assault is appropriate. 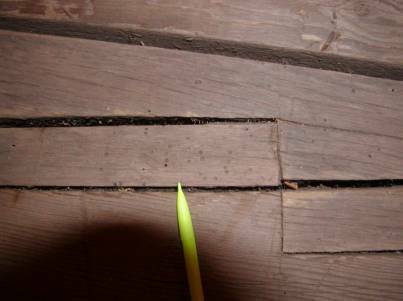 Many bridges are subject to attack by powder post beetles, especially the hardwood peg or trunnel components (see figure 79), in which the surface holes are about 1.5 mm (0.06 inches) in diameter. Just as other preservative treatments against fungi (or rot) are being developed at an accelerating rate, chemical treatments for these infestations are evolving rapidly. These in-place treatments are usually applied with spray applicators. Figure 79. Surface evidence of powder post beetles. Fire, whether by arson or from natural causes, has destroyed many heavy timber structures, and covered bridges are not exempt. Planners should make all reasonable precautions against fire loss when investing in rebuilding a covered bridge. Various chemicals have been used to treat wood products to reduce the rate of material consumption during fire or to retard the start of fire damage. The most effective applications use pressure treatment, similar to the process for impregnating wood preservatives. Unfortunately, many fire retardants introduced via pressure processes reduce the strength of the treated member. Current design specifications do not mandate specific reduction factors associated with the use of fire retardant treatments; instead, they require consultation with the manufacturer of the selected fire retardant material. Further, for extant covered bridges, the fire retardant must be applied in the field by spray or brush. At best, such surface treatments are only marginally effective. This has been a topic of intense activity for a number of years, and an effective, field-applied treatment may be developed. When this manual was published, FHWA was conducting research to identify new generation fire retardant treatments for use on historic covered bridges. Protective finish treatments are used on the exterior siding of many covered bridges (see figure 80). Such treatments could be film forming (paint, stain, or clear coatings) or penetrating (water repellent). Figure 80. A covered bridge with painted siding-Wehr Bridge, Lehigh County, PA. However, many bridges do not have such finish treatments. Figure 81 shows a covered bridge with aged, untreated siding. The bridge was built in 1838 (making it one of the oldest in the United States) and has had untreated siding since its original construction. Figure 81. Example of bridge without protective treatment (the Westford Bridge in Vermont before its recent rehabilitation). Few, if any, historic covered bridges retain their original siding. The original siding normally would have been replaced as part of a general rehabilitation during the life of the bridge (repairing bridge trusses normally requires removing at least some, if not all, of the siding). Specifying the subsequent siding replacement sometimes is influenced by the protective treatment used on the previous siding. If the siding was treated with a film-forming finish (paint or stain), it may be duplicated to maintain the bridge's previous appearance; if it was not treated with such a finish, the new siding also may not be treated. Some preservationists attach little importance to the color appearance of the siding, because it is almost never original and is considered a routine maintenance feature. Others believe that color is very important for those bridges that have been painted for a long time. In that case, one may analyze the paint on the bridge to determine compositions and colors of the remaining paint; this can guide the paint selection for the rehabilitated structure. Although an effective coating of paint or stain can prolong the life of the siding, untreated board siding usually lasts for many decades. By the time untreated siding requires replacement, the trusses often require work as well, so a general rehabilitation contract can address the siding at that time. In other words, treating the siding has more of an aesthetic impact than any special effect on the bridge's longevity. The decision to surface-treat the siding includes the obligation to maintain the treatment during the life of the siding. Because most covered bridges are over water, renewing the surface treatment of the siding is often a difficult and expensive operation. This may be the most practical issue related to the decision of whether to surface-treat siding, and it explains why many covered bridges are allowed to weather to natural browns and grays.